Forty-four individuals at NIEHS will receive 2018 National Institutes of Health Director’s Awards for their exceptional efforts. Forty-four individuals at NIEHS will receive 2018 National Institutes of Health (NIH) Director’s Awards in an Aug. 29 ceremony in Bethesda, Maryland. NIEHS and National Toxicology Program Director Linda Birnbaum, Ph.D., announced the awards to institute staff July 10 and thanked the awardees for their exceptional efforts. “These awards are truly a mark of distinction, signifying superior involvement and leadership in substantial projects,” she said. 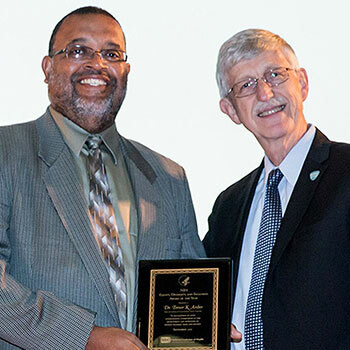 NIH Director Francis Collins, M.D., Ph.D., makes the awards every year to recognize exceptional efforts across all 27 institutes and centers of NIH. The variety of programs the awardees work on provides a window into the different approaches that NIH undertakes to improve public health. 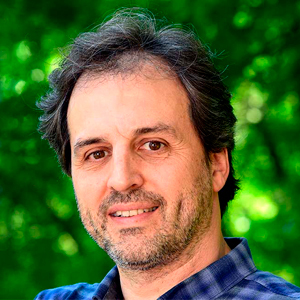 Mario Borgnia, Ph.D., successfully established the new Cryo-EM core at NIEHS and assembled a cryo-electron microscopy (EM) consortium with Duke University and the University of North Carolina. Cryo-EM is a cutting-edge technology that allows researchers to view a 3-D map of protein molecules. Kimberly Gray, Ph.D., Michelle Heacock, Ph.D., Michael Humble, Ph.D., and Srikanth Nadadur, Ph.D., all from the Division of Extramural Research (DERT), are part of a NIH-wide GEOHealth Team that Collins honored for developing the ambitious Global Environmental and Occupational Health (GEOHealth) program. GEOHealth integrates scientific research, training, and outreach through regional hubs in low- and middle-income countries across the world. Bonnie Joubert, Ph.D., and Kimberly McAllister, Ph.D., also from DERT, will receive awards as part of another trans-NIH team, the H3Africa Stage II Team. Collins said that members of this team showed exceptional leadership and dedication in implementing Stage II of the Human Heredity and Health in (H3) Africa program. Read about the March semi-annual meeting of the H3Africa consortium, which Joubert and McAllister attended, in this story from the April issue of Environmental Factor. The NIEHS Net Zero Energy Warehouse Team includes NIEHS staff, contractors, and members of the NIH Office of Research Facilities who support NIEHS. 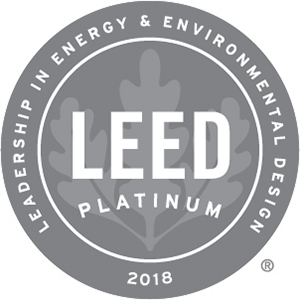 For extraordinary leadership and innovation in developing the first Net Zero Energy building in the entire Department of Health and Human Services, Collins recognized Kyle Askins, William Blair, Daniel Burk, Jeffrey Church, Debra Del Corral, Jack Field, Gregory Holland, Laurie Johnson, Paul Johnson, Kimberly Jones, Robert Levine, Stanford McKenzie III, Nancy Powell, James Stancil, Amanda Thompson, Richard Weaver, and Mitch Williams. 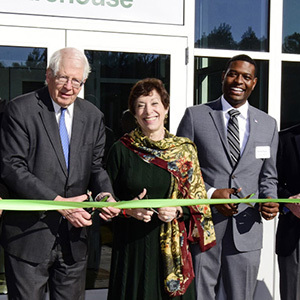 The warehouse ribbon cutting was held in January 2018. NIEHS Deputy Director Rick Woychik, Ph.D., serves on the Optimize NIH Team. The team uses a data-driven, scientific approach to support the NIH mission by improving organizational effectiveness and performance. Collins said the team performed outstanding work to communicate and engage stakeholders in the Optimize NIH Phase I implementation, which addresses ethics, responds to Freedom of Information Act requests, and manages advisory committees. Bruce Androphy, J.D., Liz McNair, Regina Stabile, J.D., Jackie Stillwell, and Mary Wolfe, Ph.D., serve on the Optimize NIH Subcommittee Team, which Collins said made exceptional contributions by gathering data and mapping processes for the Optimize NIH Phase I Implementation. Janice Allen, Ph.D., Martha Barnes, Christina Drew, Ph.D., Symma Finn, Ph.D., Kimberly Gray, Ph.D., Alfonso Latoni, Ph.D., Pat Mastin, Ph.D., Molly Puente, Ph.D., Leslie Reinlib, Ph.D., James Remington, Laura Thomas, Ph.D., Claudia Thompson, Ph.D., Steven Tuyishime, Ph.D., and Frederick Tyson, Ph.D., all from DERT, are part of the Rapid Disaster Research Program Implementation Team. 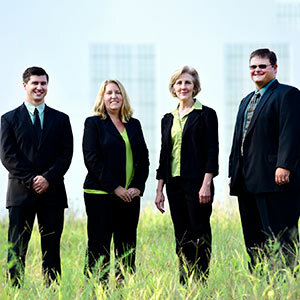 This team designed, implemented, and evaluated a program that provides rapid funding to meet public health research needs after disasters (see sidebar). The rapid funding is known as a time-sensitive grant. These grants “allow researchers to initiate research quickly in response to natural or manmade disasters, or in situations where environmental conditions will change,” said Finn, health science administrator in the NIEHS Population Health Branch, in a March 2018 Environmental Factor story about response to the water crisis in Flint, Michigan. “In the case of Flint, Michigan, the time-sensitive grant was also used to address the understandable concerns of residents about their exposure to lead, to give them rapid information on how great the risk was, and ways they might [reduce or limit] the exposure,” she explained. Hurricanes and floods are some of the natural disasters that the award-winning Rapid Disaster Research Program is designed to respond to with research funding. Such disasters can present special challenges for workers involved in cleaning up the damage. The NIEHS Worker Training Program provides resources aimed at protecting the health and safety of those responding to the aftermath of a hurricane or a flood(https://tools.niehs.nih.gov/wetp/index.cfm?id=2472), including emergency responders, skilled support personnel, homeowners, and business owners. Check out NIEHS Environmental Health Topic on Weather Extremes to learn how extreme weather may affect health, what NIEHS is doing in about it, and links to more information.